The usually quiet 300 block of Norris Street in Edgefield saw some excitement Saturday, April 26, 2014. Just before 6:00 PM, an abandoned moped caught fire in the parking lot across from the Methodist Church. No one at the scene could be identified as the owner of the moped. David Colman was working in his maintenance shop at the Town of Edgefield complex when he noticed thick, black smoke rising into the air a short distance down Norris Street. 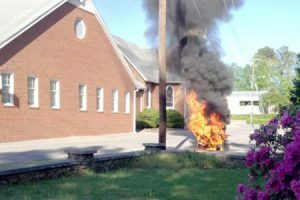 “My first thought was that the Methodist Church was on fire,” said Colman. He sounded the alarm, jumped in the fire truck and proceeded to the scene, where he quickly extinguished the blaze. Later, officers from the Edgefield Police Department arrived on the scene to investigate. If you have any information concerning this incident, please contact the Edgefield Police Department at (803) 637-4060.